They’re all having a baby. On her way home, her thoughts raced back to her kitchen. The groceries she needed. The fruits she wanted. The other lame items that were on her mind. She picked all of those. Struggling with a heavy grocery bag and yet somehow the superwoman in her managed to pull out the headphones from her sling bag and dump them into her ears. A faint smile ran across her face. Nothing mattered when she thought of him and the music that reminded her of him. Finding the keys to her house was by far the most daunting task, each day. Standing in front of her door, a bunch of neighbours who regularly stood across the balcony would stare right into her soul. Or at least they wished they could. Stumbling into the dark passage, she went for the lights. There she was; back to her monotony. Somehow, the dead office environment, the dislike for her job, her neighbours, her groceries, her kitchen, a few stolen kisses from her husband and her bed; not forgetting the occasional smiles of her niece from the building across the road; was all she had during what’s supposed to be the best phase of her life. And well, no one really cared. Because they were all going to have a baby. You taught me wisdom. But, didn’t wait to see me use it. It’s the 21st of June, 2015, almost 5 years since you left me here, all by myself. It’s Fathers Day today. You had a choice. A choice to let me have a saner life. You didn’t take it. Why? Wait, let me guess, you thought I was ‘ready for it’? Or maybe, you thought I was so grown up that I didn’t need you anymore? Or, because mummy and Ralph were around for me? Or, because you thought Roman would be half the man you were? Or, did you just give up on me? You ruined me. You left me broken. Broken in a way that I can’t even get myself to say the word ‘mend’. You left me without any answers. I don’t even know if it’s worth writing to you. Because, hell yeah, you are reading this. You know everything that’s been running through since that God-forsaken day. And, you won’t do a thing about it. Because you’re a nobody now. I don’t feel you any more daddy. I don’t. Is it good? My big man was frail. He was afraid. He wasn’t my hero. He wanted me to be his. He was afraid of the world. Afraid of being hurt more and more each day. He did not have it in him to fight any longer. He lived in silence. He lived in despair. He lived in betrayal. I wanted to be that one person who gave him that hand. Only if he had let me. As kids, or even as adults (who have found new wisdom) we are conditioned to run after things we only think we aspire for. A race that is marked by sheer pressure. A race to win. A race to be the competent one. A race for the righteous and the race to prove one’s stance. But, I hardly come across anyone who is actually in the race to be content; satisfied and happy. We’re making the same mistake that we probably promised ourselves we wouldn’t make. And that is, being governed by someone else’s directions for a journey that is yours, and only yours to tread. So what if they think you’re not the best. At least you’re trying. So what if you aren’t the one enlightening the world. At least you’re trying to enlighten yourself. So what if your dreams don’t match what they expect of you. 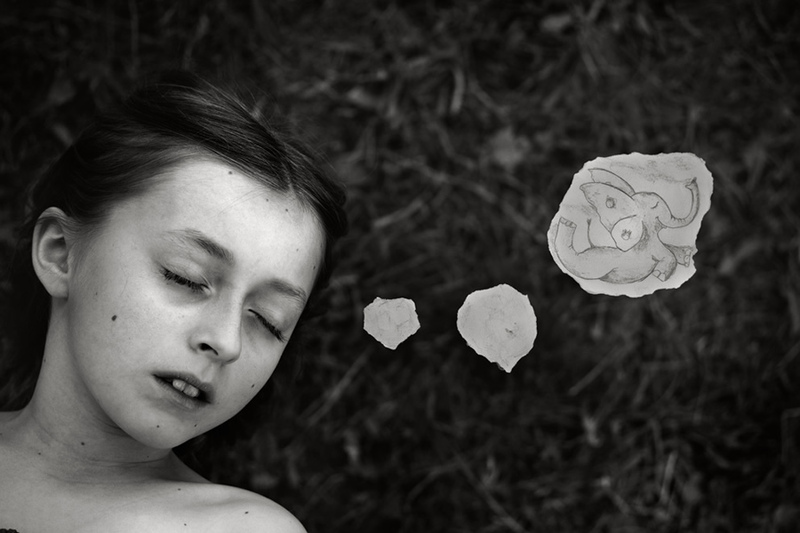 At least those dreams are your own to realise. Easier said than done I know. But this one’s actually for me. Because I’m tired of notifying myself of this exact thought. I’m weary of wanting to feel free. If only I could give anything in the world to know what it’s like to not care. At all. Moving to my birth city was not on my agenda, until I found out, not everything works as per my wishes. Once a Mumbaikar, always a Mumbaikar? Not really. The person that I am, I found solace in the arms of another city. A city alien to me, until 2 years ago that is. Moved here, to Pune, and cursed my fate for leaving me stranded in the midst of strangers. I began strolling unknown streets, observing unknown faces, relishing local chaat and learning to enjoy the evening breeze. But something was definitely missing. The flavour. The city was yet to drape me in its eventful flavour of people and ambience. And so it did. The mornings are more than just waking up. The day is dreamy. The evenings let you spend time with yourself. Whether at work or not. The streets never let you walk alone. Now, after creating, sharpening and painting memories that have attached themselves to me for a lifetime, I’m not sure if I’m ready to give up on them. Mumbai is where I was born and where I learned to smile. Pune is where I moved and where I learnt how to keep smiling. There’s a difference. Please don’t take offence dear fellow Mumbaikars. Nothing personal. This experience differs from person to person. If not for my 2 year shift, I wouldn’t have known to distinguish between my likes and dislikes. I wouldn’t have learned to be more assertive. I wouldn’t have learned to say no. I wouldn’t have considered shifting gears on work profiles. I have come to believe that I’m a Mumbaikar, who must explore it, but by periodically staying away from it. The spirit and the enthusiasm are commendable; although I’m only human, and I’m scared I won’t have that spirit clinging onto me for a long time. I need to stop. Somewhere. Breathe and let go. A few Punekars, in their state of ignorance and diplomacy, have given me an outlook that I want to savour. A few lessons learnt, a few friends by my side, a few incidents that define failure, a sense of doing it right, a mentor I can fall back on and a handful of people to hold on to for as long as we plan to. For now, I’d like to believe it is forever. Discover the beauty of uncertainty. Let your inhibitions go. Fall of your chair once a while when you watch a stupid video. Hold your mom’s hand and squeeze it tight. Don’t forget to smile after that. Steal a 100 from your brother’s wallet. Text him about it after an hour. Tease a kid on the road. Chase a dog down a busy lane. Run after a truck. Let that fear fail. Or may be let it win. If it wins, you learn what not to do wrong. If it fails, you learn what to do right. Don’t let your heart be broken. 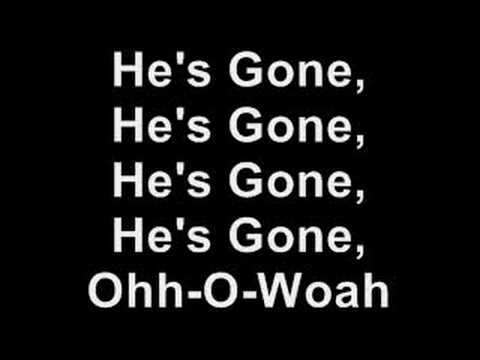 Oh wait! What rubbish. Let your heart be broken. Let it be shattered. See it rumble to pieces. Then play your favourite sad song and drink your sorrows to the last glass. Throw up on your friend’s couch. Her favourite couch. Watch her scowl. Read a book and criticize it if you haven’t liked it. There’s nothing wrong about it. Watch a completely baseless movie. Confide in your best friend that you absolutely loved it. Let those people judge you. Hear them. Laugh it out. And move on. They don’t matter. Open yourself to all the negativity. Let it seep in. Then with all your might throw it out. Feel good. Believe that good happens. Because it does happen. You won’t be unhappy all your life. That’s a promise. Because I’m not. I am everything ‘they’ don’t want me to be! I am not the 7 am person everyone is. I am not the health conscious fitness freak. I am not the intellectual 2nd bencher. I am not a walking-talking Wikipedia. I am not the person who is updated on current affairs, at most times. I am not the person with a dream. I am not the person with one specific passion. I am not the person with a creative hobby. I am not the person who wants to sleep at 11 pm each night. I am not an award-winning writer. I am not the writer who just cracked that mind-blowing idea. I am not the person who listens to great music. I am not the person who can’t lie. I am not the person who can finish what’s on their plate, all the time. I am not the person who is a favourite. I am not the person who can save money cleverly. I am not the person most people are. I am not the girl who completely detests pink. I am neither the girl who’ll have a pink phone cover. I am not the girl with a sultry figure. 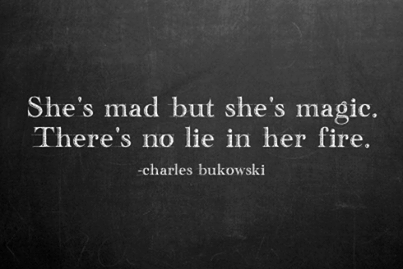 I am not the girl with that ‘fire in her eyes’. I am not obviously pretty. I am not a crazy book reader. I am not the quintessential art lover. I am not the person who can judge people. I am not the person who can live in retrospection. I am not the girl who chews with her mouth close. Sometimes. I am not the girl who can laugh softly. I can’t even speak softly. In fact, I also find it very difficult to think twice before I speak. I have problems. And I deal with them only when I’ve had enough of my sleep. Actually, only after I’ve had my first cup of tea in the morning, at 10. And after all these third-world problems. 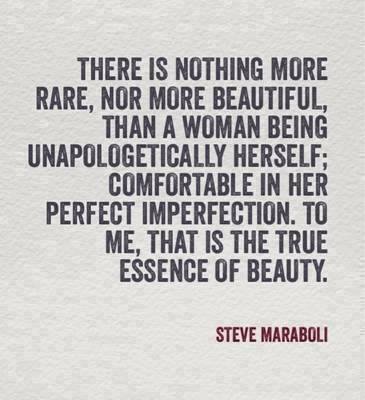 I found out something very beautiful about my imperfections. I am the greatest listener you can find. I am your mind-reader. I am that person who can make you believe that your problem is not really a problem. I can bring you back to peace. I can make you smile! News Channels need to focus on simplicity. 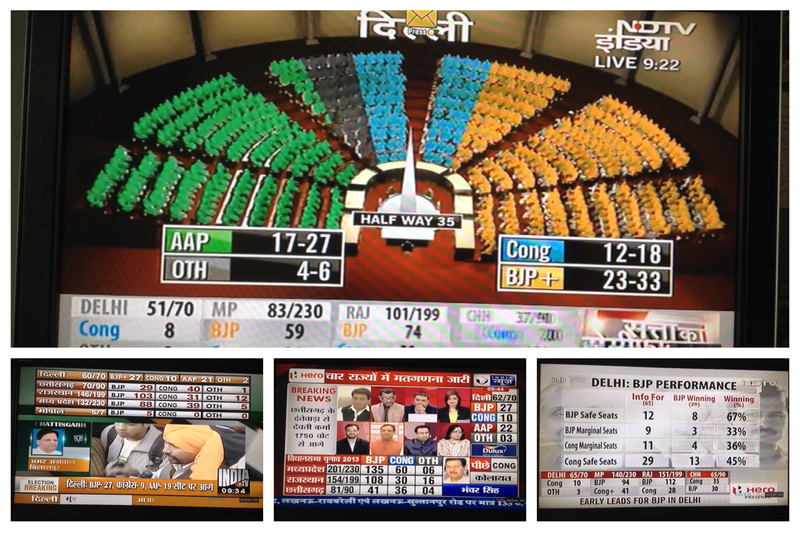 Observations and analysis of election results broadcast. 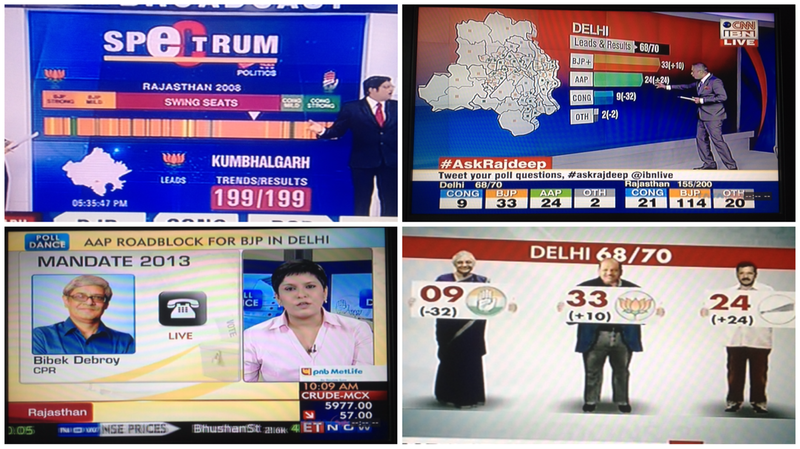 As we all can imagine, Vote Counting Day is a special day for news channels. It’s full of many challenges. Information is dynamic, multilayered and highly volatile. Screen space is limited. Engaging viewers, throwing dynamic insights, igniting interesting discussions and simplifying information is important. Revenue generating space needs to be accommodated on the same screen space. Motivating viewers to be more interactive through Social Media is another task. Complexity increases when there are elections in multiple states. I was witnessing this on Sunday, 8th Dec and realised that we need better information designers working for television industry. Some channels are trying to innovate new models where as some are ignoring viewer needs and sticking to their brands colours and good looking graphics.